Aiyaary is the unique title given to an upcoming thriller Bollywood film that is going to release on the occasion of India’s Republic day that is 26th January 2018. Moreover the film is based on the corruption that is going in the Indian army, the story of this film is said to be based on a true incidence and trailer of this film is already released on YouTube. Airyaary is a very unique name to keep a title of a movie, but we all know Neeraj Panday serves a different dish every time he make us to rush to theatres for her movies. Just like previous master pieces from him like Special 26, Baby, A Wednesday and M.S. Dhoni: The untold story, we have Aiyaary this coming year. In a dialogue during the trailer of this film, Manoj Bajpayee says ‘If you don’t understand the meaning of Aiyaary, go and Google it, you will know, so we did the same. Here is what we got from Google, as the director of the film was already up on the Google to explain the meaning of this word before any other dictionary, the title Aiyaary means “Ultimate trickery” which is what a soldier do with his claver and sharp mind during the days of his duty and which is why he earns respect from the world. In part of star cast, the film is really strong as it includes many well known faces that have been seen in Neeraj Panday’s previous movies as well. It includes Sidharth Malhotra who will be playing the role of Major Jai Bakshi, Manoj Bajpayee in the role of Colonel Abhay Singh along with him we have very famous artists like Naseeruddin Shah, Anupam Kher, Rajkul Preet Singh, Pooja Chopda, Adil Hussain and Kumud Mishra. There is a great confusion after watching the trailer of the movie as it cannot be judges that who is the hero in the film and who is doing the role of villain, but it stand with Manoj Bajpayee and Sidharth Malhotra as it lefts you totally in a mystery that what has exactly happened. Major Jai Bakshi who is in the Indian army, lefts his job after listening to something during his duty and he decides to throw everyone out from the Indian army who is not worth of it, where as Colonel Abhay Singh is in race of finding Major Jai Bakshi and arrest him for life time but Bakshi tells Abhay Singh that it is not that easy to catch him as he has learned all the tricks from Abhay only. This thriller is a bit mystery as well, which will defiantly give us Goosebumps at its end along with this we will be expecting a message for the society as well. The movie is produced by Shital Bhatia, co-producers are Dhaval Gada, Aksshay Jayantilal Gada, Karan Shah and Motion Picture capital. The production companies involved are Motion Picture Capital, Friday Film Works, Pen India Limited and Plan C Studios. Overall distribution is done by Relince Entertainment. Aiyaary planned to release on 26th January 2018 but there are two more movies that are also all ready to release on the same date staring Bollywood well known actors. One of them is Sushant Singh Rajput’s Chanda Mama Door Ke another one is Pad Man staring Akshay Kumar and Sonam Kapoor. 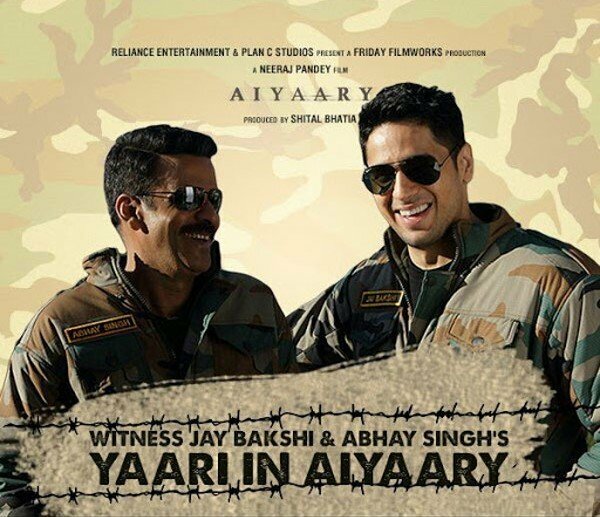 The shooting of Aiyaary is done in Delhi, Kashmir, London and several other places that are related to army along with some sets were made ready for better views. Overall this movie will be adding one more master piece to the Neeraj Panday’s well known movie, we look forward to the screens and this movie to be released, stay connected for more updates on Bollywood and Pollywood industry.